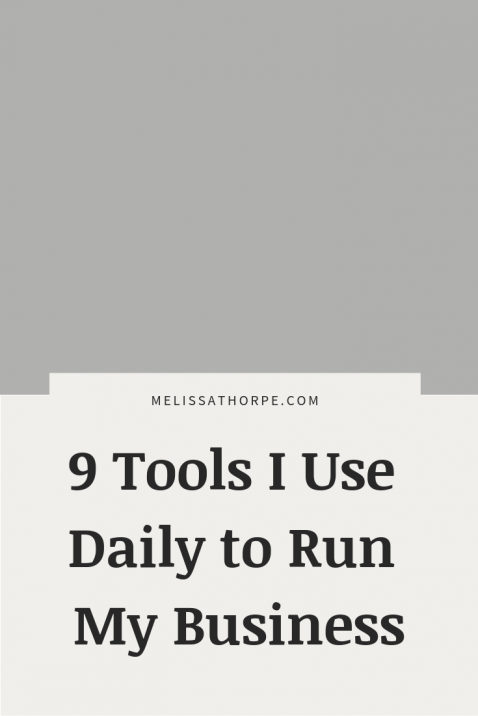 I’m always surprised at how frequently I’m asked about the tools I use to run my business. I usually respond with a rambling list of the tools I use (which is a lot!) and I’m pretty sure I overwhelm the person each time. Many of those tools that I respond with are not tools I continually use; they just happen to be tools I’m playing with at the time. So I decided I wanted to compile a list of my “must have” tools that I use daily (or almost daily) and have used for some time now. In fact all but one I’ve been using for almost 2 years, if not longer! If you’ve never used any of these, I highly recommend checking them out! I’ve been using GoDaddy Bookkeeping since July 2013. In fact, when I started using it it was called Outright. I was hesitant to continue using it when I found out GoDaddy had purchased it because I’m not a huge fan of them when it comes to hosting. Luckily, they haven’t changed anything (that I’ve noticed) except requiring a GoDaddy login. It’s also my understanding that the Outright team is still behind the operation. I’ve tried many (many!) other bookkeeping apps, but this one hands down is the best. The main reason I love it is because it’s the only app I’ve found that properly distinguishes fees when paid through PayPal or Stripe. It also has an iOS app that I can use to see my income and expenses at a quick glance. And it automates the numbers I need to fill in a Schedule C for taxes. Oh, it provides me an estimate of my quarterly taxes as well! So while GoDaddy Bookkeeping is great for tracking taxes, income, and expenses, it doesn’t allow you to budget the money into categories. That’s where You Need a Budget (YNAB) comes in. I started using YNAB for personal budgeting in early 2014 and it changed my life. Seriously, budgeting is an addiction now. I actually call it my spending plan. I love playing with the money and putting it into different categories. It’s AMAZING. I highly recommend checking it out. They offer a free 34-day free trial too! I’ve been using Harvest since September 2013 to manage my clients, invoices, projects and time tracking. Technically, GoDaddy Bookkeeping does offer time tracking and invoicing; however, I love how Harvest is project AND client based (not just client based). Plus, the absolute MAIN reason I love Harvest and have stuck with it so long is because it has an OSX app that allows me to track time in my menu bar. It’s the only service I’ve found that offers this (and I’ve tried SO MANY over the years). All the other time tracking options require me to keep the time tracker open in another tab or window or on my desktop. And guess what? I NEVER remember to turn it off. With the Harvest app, it’s right in my menu bar so I can see it as I’m working. Pro-tip: I don’t actually work by the hour much anymore; however, I still like to make sure I’m pricing my packages appropriately and finding areas in which I can be more productive. Time tracking helps with that. This is the newest one on the list and the only one that I’ve been using less than a year. I officially have had a ConvertKit account since late last year, but I WISH I had been using it longer! ConvertKit is my favorite email marketing tool for many reasons (full blog post on that coming soon). It lets me run my business easily and effectively by segmenting my users based on their actions. Plus, it’s an essential tool for my clients! I first started using Asana with a client in September 2014. It was appealing to my list-loving self. But honestly? I had almost always kept my to-dos in my head. I’m very good with remembering everything I need to do (especially if it’s not deadline based), but then when my projects and client needs started increasing, I turned back to Asana. It just made sense for big-picture planning. When planning my day-to-day tasks I use Asana to decide what needs to be done when and I write them in my personal planner. I love using Google Apps for my email, document storage, and document processing. I’ve been using it since August 2014 and it has made business so much easier. I get asked a lot why I choose Google Apps vs. redirecting my email to Google. The answer is because relying on your hosting account for email is (in my opinion) putting too many eggs in one basket. If your hosting server goes down, you also lose access to email. Plus, making sure I remember to select which email to send as and filtering the emails properly became cumbersome. In addition, Google Apps offers more storage within Drive which I love for collaborating with clients. Using Google Docs and Google Sheets with clients lets us collaborate so easily and even in real time. Fun fact: The only files stored on my computer are Downloads. Whhhhat? Yep! I use Dropbox to store 90% of my digital assets (the other 10% is Google Drive if you’re wondering). When I purchased my Macbook Pro 2.5 years ago I made the decision to use a cloud-based system so I wouldn’t have to worry about my computer crashing and losing everything. Plus, I can access any file at any time. It works amazing for sharing files with clients as well. I purchased the Pro plan in October 2014 and haven’t looked back since. I even pay the extra $39/year for version history in case I need it. Prior to purchasing the Pro plan, I was “gaming the system” by having multiple accounts (because I would run out of storage) and it was a mess. I never knew where anything was stored, I had to log in and log out of each account and I couldn’t stand it any longer. I feel like Internet browsers are often forgotten on these types of lists. But seriously, I’m in Google Chrome, with my many many tabs, at least four hours a day just for my business. Chrome has come a long way over the years and it’s definitely my browser of choice. It has great development tools, a bunch of extensions to further extend its functionality, and it syncs well across multiple computers. You can actually log into the browser itself and it’ll save all your preferences, bookmarks, and extensions. Plus, my favorite part, you can create profiles for different purposes. So I have a business profile and a personal profile. I log into the personal profile window with my personal email and then my business profile I log in with my business email. The history, preferences, bookmarks, and extensions are different across each and it allows me to separate those areas of my day-to-day life easier. Win-win! LastPass is my sanity SAVER. Seriously, who has time to remember a billion passwords? Not me! I literally remember one strong password and then every one of my passwords is stored in LastPass. I use the Google Chrome extension so whenever I need to log in to an account, I can just select the account from the username/password fields and it fills in the info for me. Plus, when clients need to share their account information with me, LastPass makes it fast, easy, and secure. I don’t have to see their password, but I can login to their accounts. I sprung the $12/year (so cheap!) in 2014 to use the mobile version, but otherwise, it’s free! You might be wondering, do I actually use all 9 of these tools every day? And the answer is definitely yes! My business would not be where it is today without the use of these tools. I try so many tools (shiny object syndrome! ), but I always come back to my trusty favorites. What tools are essential for you and your business? Asana has been a total game-changer for me. I’ve never heard of LastPass however– I’ll have to give it a go. I honestly feel like I spend the first hour of my day trying to log into my accounts! Right, it can take soooo much time! Definitely, check it out and let me know what you think!